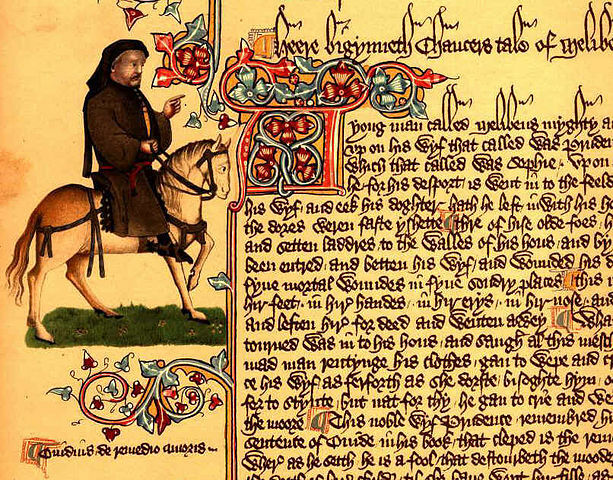 Portrait of Chaucer as a Canterbury pilgrim, Ellesmere manuscript of The Canterbury Tales. Introduction: As Chaucer’s Canterbury pilgrims compete in their Host’s tale-telling challenge, they bicker and mock one another, form both alliances and rivalries, and critique one another’s religiosity, gender performance, and social class pretensions. These characters are an emotional lot, not least among them the Man of Law, a narrator who tells a heart-wrenching tale that moves even the teller; he pleads ardently for his audience to feel his heroine’s travails, while also exhorting them to condemn his antagonists. What’s more, we Chaucerians who study the tale of Custance sometimes resemble the lawyer-narrator in our tendency to be affectively transported by our subject matter. Inspiring more intense responses than many of the other Canterbury selections, the Man of Law’s Tale makes critics take sides. In particular, we argue about whether the narrator bears a sincere or ironic relationship to Chaucer’s own views. We struggle to define the tale’s heroine as passive or active, to determine whether she upholds an ideal of Christian femininity or whether she reflects a condemnation of medieval Christianity’s tensions and its traumas. And more than perhaps any of the other tales, the story of Custance has called us to arms in a battle over how to read medieval texts. One camp sneers that the other is presentist and anachronistic; the other camp retaliates by implying that its foes are apologists for fourteenth-century gender and racial prejudices. The discussion can become downright nasty. But could it be that this is exactly how Chaucer wants us to behave?